This morning, Samsung announced the Galaxy A8 and A8+. Like the LG Q6, the A8 and A8+ bring Samsung’s bezel-less display technology to the company’s mid-range lineup. 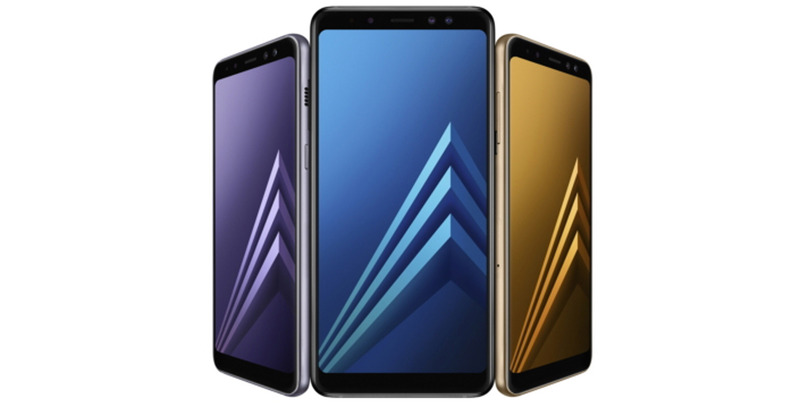 The A8 features a 5.6-inch display with 1080 x 2220 pixel resolution and 18.5:9 aspect ratio, while the A8+ has a 6-inch display with the same resolution and aspect ratio. What’s more, both the A8 and A8+ include dual camera setups — though, in this case, Samsung has decided to double up on front-facing cameras. The two phones feature a front-facing camera with one 16-megapixel sensor and another 8-megapixel sensor. In front of the sensors are two f/1.9 lenses, with Samsung’s Live Focus feature is also making its way over from the Note 8. As such, A8 owners will be able to use their phone’s front-facing camera to take selfies that feature attractive blurred backgrounds. Moreover, like on Note 8, A8 owners will be able to adjust this effect even after taking a photo (that is, as long as they made sure to enable Live Focus before taking the photo in question). Meanwhile, on the back of the device is a 16-megapixel camera with f/1.7 aperture and phase detection auto-focus. Most people, however, will notice that the A8 and A8+’s fingerprint sensor is positioned below the camera module. With the Galaxy S8 and Note 8, Samsung made the curious decision to place the fingerprint sensor to the side of the main camera module. For most, this was their main gripe with the S8 and Note 8. The fact that Samsung has changed course here is good news for its upcoming flagship refresh. In terms of their other internal specs, the A8 and A8+ are very capable devices. Both phones feature an unspecified (likely Samsung Exynos) octa-core chipset with two high-performance cores clocked at 2.2GHz and six low-power cores clocked at 1.6GHz. In addition, the chipset features a LTE Cat. 11 modem, though Samsung has yet to announce band support. Elsewhere on the connectivity front, the A8 and A8+ include support for Bluetooth 5.0 and Wi-Fi 802.11ac. Both phones also support the company’s Samsung Pay mobile payments platform and a USB-C port for charging. One thing to note is that Samsung makes no mention of a headphone jack in its press release announcing the two devices. We’ve reached out to the company to confirm whether that feature is missing. The A8 will ship with 4GB of RAM and will be available in either 32GB or 64GB storage configurations. The A8+, meanwhile, will be available in 4GB and 6GB RAM configurations, as well as 32GB and 64GB internal storage SKUs. Lastly, both phone features feature IP68 water and dust-resistance, and they’ll be available in four different colours: black, orchid grey, gold and blue. If there’s one other disappointment, it’s that both devices will ship with Android 7.1.1, not 8.0. Samsung says the A8 and A8+ will launch in early January. We’ve reached out to the company to find out if it plans to bring the A8 and A8+ to Canada. Stay tuned.